Day 2 continued the pattern of gripping interactions with amazing people. Moses (in the yellow shirt) is a pastor from South Sudan. Because of the wars there, he has spent most of his life living in refugee camps – if you can call that living. At breakfast I asked him about his current situation. His home area is completely destroyed so he came to a camp in the Adjumani region of Uganda. They have lived nearly two years in a tent with a useful life of 6 months or so. Of course there are no more tents available so they do what they can to keep it together. He told me of his pre-teen life as he, his mother and brother were burned out of their home by soldiers, escaping into the bush with almost nothing. They would build hut under a tree, live there a few days, and then run again when the soldiers came. His mother would collect firewood to sell to by their only “meal” in the evening consisting of a small amount of grain. He and his brother would grind it with stones, cook and eat. His whole life has been in similar situations of extreme hardship. In the midst of all that he has a robust contagious faith. 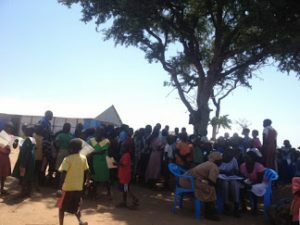 Moses’ church used to meet under a tree, but more recently they have managed to scrape together canvas walls and a metal roof – a great blessing. There is also a school meeting there with a huge group of students, trying to learn so they can get out of the camps. It would seem hopeless but they find hope in Jesus and many are able to get education and move into one of the cities, where they send most of their money home for the family. In the worship time we sang about stamping the Devil when he attacks (video here). It is Mama Iberia (my spelling) and the Congolese team leading so it is enthusiastic and full of movement. We went to Jesus loves me, Jesus loves you first in Swahili and then in English, which lost some of the enthusiasm in translation. (of course I put my camera away and joined in!). 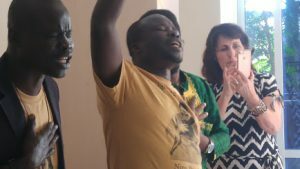 But the song that brought a deep emotional response was when they were singing “Jesus has been so good to me – He has given me so much” The picture of Moses above was taken as he sang that song – man who is living in the extreme hardships of a camp. It is being sung by Mama Abia, who works astonishing healing with seriously mentally ill people in one of the worst war zones in the world. The robbers have broken into every house around theirs to steal and kill, but never her house or the clinic: Prayer Works! These are the ones singing the song with deep passion. It is led by Esther. She is the #1 student in her university class. Nine years ago her father gave them a Christmas “present” by abandoning the family, taking all their money to be the dowry for his new wife. Her mother worked constantly to get money to feed her and her twin brother. There was no money for school fees, so Esther sold her phone to start a business so her brother could go to school. Because she is such an outstanding student various people have helped her scrape up the $350 or so, a fortune here, to do a term at school. I could help but compare high schools in the US spending this much or more for a “promposal” where students will hire a mariachi band to invite a girl to the prom. The Bishop from Rwanda told of the murder of his mother and brother in the genocide. He escaped by fleeing into hiding in the bush, running from spot to spot when it broke out. To this day he has no idea where his mother’s grave might be. By the gracious transformation of Jesus, he is now pastor of the people who murdered his mother. Who can do other than marvel at the power of Jesus. These are some of the people I get to do the summit meeting with. They are the ones who do trauma healing in people living through this kind of traumatic life events. Amazing is not nearly adequate. This entry was posted in Travel Journal by Gerry Breshears. Bookmark the permalink. Thank you for sharing their stories. The worst moment in my life holds no comparison. What amazing stories. I cannot imagine what an emotional trip this is for you too! Praying for you and all as you share. I just don’t have words to share what my heart feels reading the blog! Thanks, Diane. It is indeed amazing!